In 2012, ISLF launched a livelihood project aimed at providing assistance to the members of the Melinchimunai Fishermen’s Cooperative Society. The objective was to strengthen their livelihood and economically empower the members of the Society. The assistance included providing each member of the Society a set of crab nets and constructing a “multi-purpose building” for the society. The major fishing activity of the Melinchimunai fishermen was crab and prawn fishing. Crab fishing is a profitable venture. Traditionally, the fishermen catch crabs in the shallow waters of the sea and sell the crabs to local fish merchants, who are actually “middle-men“in the market chain. These merchants in turn sell the crabs to bigger, Colombo based fish companies. Before selling the crabs to the merchants, the fishermen grade the crabs that they catch. Only crabs that weigh more than 400 grams or more are sold. The smaller crabs also called “soft crabs or post molt crabs” are normally discarded or sold at a relatively lower price to the local population. Recently, the Melinchimunai fishermen have shown interest in “crab fattening”. Crab fattening is fattening the soft crabs or post molt crabs in confined spaces to fill up their meat within a shorter period of time. 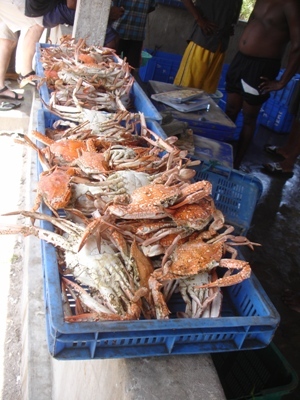 In this feature article, some information concerning crab fattening is provided in order to promote crab fattening as “potential livelihood activity “to small-scale fishermen. It should be noted that two types of crabs are caught and sold in the coastal and lagoon areas of Sri Lanka, namely (a) mud crabs (Scylla serrata) and (b) shallow sea crabs or blue crabs (Callinectes sapidus). Once boiled, the shell of the blue crab turns orange brown. Much of the literature and practical experience in crab fattening is related to fattening of mud crabs. Mud crabs live in lagoons and coastal areas associated with mangroves inundated with full salinity oceanic water for the greater part of the year. Mud crabs can tolerate reduced salinity. Download Full Document of "Crab Fattening – A potential marine aquaculture industry for small scale fishermen"